New year, new skin care routine! After the hedonistic craziness of Christmas and New Year, your skin is probably needed a little more TLC than usual. 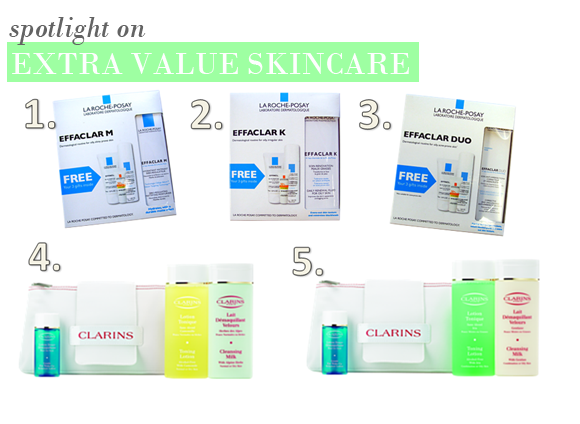 To help you out, French skincare giants Clarins and La Roche-Posay are offering excellent value sets of some of their most popular products at a fraction of the price. The Clarins Your Cleansing Essentials gift sets include a Cleansing Milk, Toning Lotion, Gentle Eye Make-Up Remover and a Cosmetic Bag with a saving of £15.60, while La Roche-Posay are offering gift sets of their three of their most popular Effaclar products complete with three extra products at no extra cost. Includes: Effaclar M 40ml, Thermal Spring Water 50ml, Effaclar Gel Wash 50ml, Anthelios Extreme Fluid 50+ 5ml. If you find that your skin is unbearably shiny even after using mattifying products, then Effaclar M is the one for you. It neutralises shine at the source, intensely moisturises and helps to balance your skin for a long-lasting velvety complexion. Packed full of vitamins, absorbent microspheres and has a comfortable oil-free texture for beautiful skin. Includes: Effaclar K 30ml, Thermal Spring Water 50ml, Effaclar Gel Wash 50ml, Anthelios Extreme Fluid 50+ 5ml. This one is the texture transformer, gently micro-exfoliating your face daily. If you’re imperfection-prone with large pores, then this is the moisturiser for you. This skin-corrector progressively transforms the skin’s surface with LHA, a keratolytic active ingredient that very finely exfoliates without irritation. The complexion is left refined, pores are tightened and unclogged, and imperfections are erased. Includes: Effaclar Duo 40ml, Thermal Spring Water 50ml, Effaclar Gel Wash 50ml, Anthelios Extreme Fluid 50+ 5ml. If you suffer from severe skin imperfections, look no further. Effaclar Duo is a complete skincare product that swiftly targets severe localised imperfections and pores clogged with sebum. Redness is reduced, skin is refined and the pores are purified. Even the most severe imperfections disappear, with lasting balance to restore all the qualities of healthy skin. Includes: Cleansing Milk Norma/Dry Skin, Toning Lotion Normal/Dry Skin, Gentle Eye Make-Up, Clarins Cosmetic Bag. Effective, gentle and soothing. The Cleansing Milk glides over skin without tugging, and removes every last trace of make-up without irritating the skin. The Toning Lotion is infused with Camomile to rebalance the skin gently, removing all traces of cleanser. The Gentle Eye Make-Up Remover removes all light eye make-up and is extremely soothing. Skin is left feeling light, supple, soft and clear. Includes: Cleansing Milk Oily/Combination Skin, Toning Lotion Oily/Combination Skin, Gentle Eye Make-Up, Clarins Cosmetic Bag. A rebalancing set for oilier skin types. The Cleansing Milk gently purifies the skin, mopping up oil, soothing redness and decongesting troublesome skin. The Toning Lotion is infused with Witch Hazel and Aloe to rebalance and deeply purify. The Gentle Eye Make-Up Remover removes all light eye make-up and is extremely soothing. Skin is left feeling refreshed, light and refined. I've been having a lot of issues with my skin with regards to breakouts. This product really helped some of those skin coloured bumps come to a whitehead. Overall helped the texture of my skin and helped blemishes heal quicker. The only issue for me is that as this is more suited to an oilier skin, it didn't moisturise my skin as much as I would've liked but it's not a criticism of the product as it is meant for oily skin and not dry skin like mine. It does do what it says however, and doesn't cause irritations. This entry was posted on Thursday, January 13th, 2011 at 11:17 am and is filed under Gifts, Offers, Skincare. You can follow any responses to this entry through the RSS 2.0 feed. You can skip to the end and leave a response. Pinging is currently not allowed.